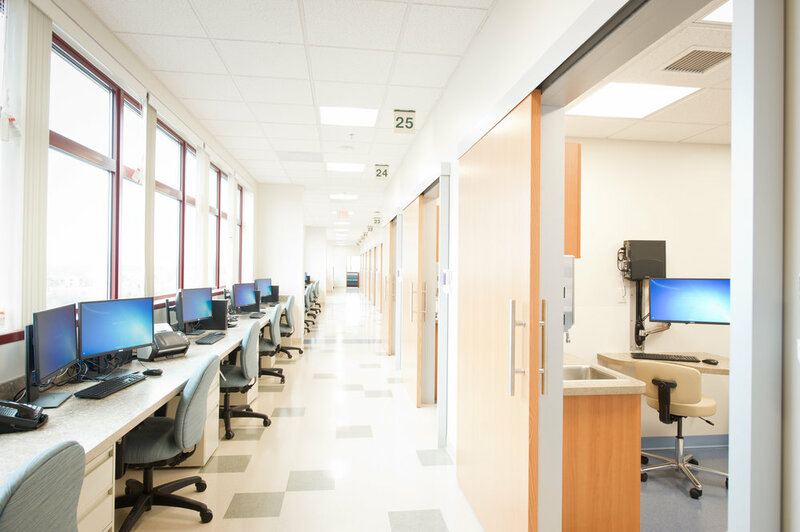 In an effort to better integrate and coordinate patient care as part of the patient centered medical home delivery model, Anne Arundel Medical Center consolidated multiple specialties into one suite in the Belcher Pavilion located on their Annapolis campus. Their Multi-Specialty practice brings together Cardiology, Diabetes & Endocrine, Neurology, Neuropsychology, and Palliative Medicine into one 17,000 SF suite. The suite encompasses 29 exam rooms that can flex between specialties as needed. Testing Rooms include one nuclear camera, two stress test rooms, two ultrasound rooms, and one EMG. Lean design principles were applied to the process and flow. Some of the noticeable features include the separation of flow between patients and staff using an on-stage/off-stage approach. Centralized scheduling, testing and care team work areas within the suite encourage collaboration between the subspecialties. On-site testing and educational space is also an integral part of the practice, bringing the centralized services to the patient.